Jeamar Slack Rope Detectors Are Cold Formed From High-Grade Steel. The forming process works to harden the tread surface, ensuring increased rope life. Slack rope detectors are fitted with high-efficiency ball bearings for smooth, maintenance-free operation. A minimum pitch diameter of 15:1 is standard on all slack rope detectors, reducing the bending stress on the rope. Jeamar’s slack rope detector can sense lack of tension on the load line and react immediately. Its fast response time gives you have the most time to react to the situation. The slack rope detector is also adjustable, providing for the exact degree of slack required. Our slack rope detector can be mounted at any point on the load line. This versatility makes it easy and economical to mount. 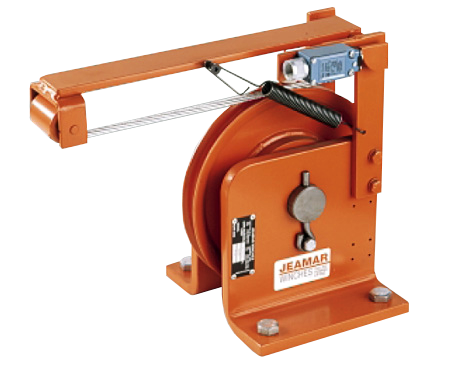 Jeamar’s slack rope detector features lifetime lubricated bearings for minimum maintenance. It’s compact, rugged and ideal for outdoor use. Jeamar slack rope detectors are rated for the full working load limit at 0° rope angle.